When most people think of robots, the image of a large, lumbering box used on assembly lines often comes to mind. But the reality is, with the flexibility of cobots, companies can automate even the simplest of tasks. 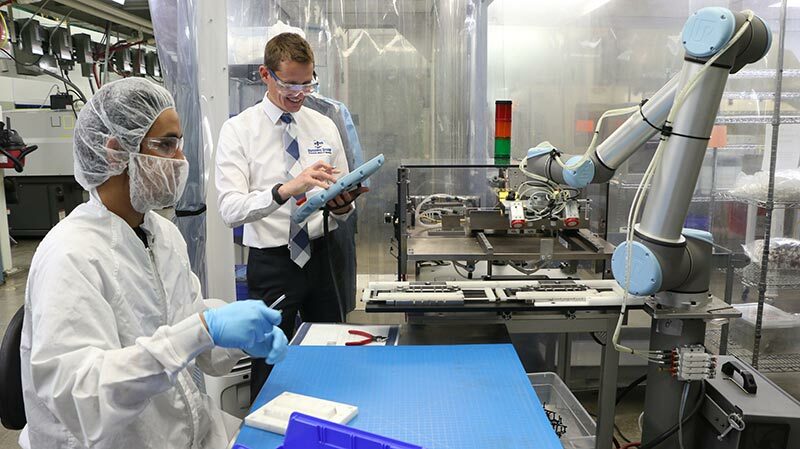 Regardless of the scale of output, cobots can be deployed for processes that are repetitive, manual, or potentially strenuous for workers – such as pick and place, packaging and palletizing, screw driving, gluing, dispensing, and welding. At Creating Revolutions, a small Miami-based start-up that makes a customer service paging system for the hospitality industry, assembling its communication disc is a complex task requiring great accuracy and repeatability, which prompted the start-up to look into automation. The company looked at 40 different robot companies, “most of which proved to be too big, too complicated to program or too jerky,” said Einar Rosenberg, Creating Revolutions CEO. “The UR3 was elegant, smooth, and offered the exact precision we really wanted. It’s so exact that it’s even turned into a selling point, easily impressing our customers.” Before the UR3, Creating Revolutions experienced double-digit rejection rates. Now, with the UR robot in place, that number has fallen to less than 1%. For a long time now, the message within manufacturing has been that robots steal jobs. Quite the opposite is true. Robots actually relieve workers from strenuous and repetitive tasks so that they can take on better, more exciting roles within the company. And, with the robots helping to increase productivity, companies often find themselves in a position to hire more people, thus creating jobs, not eliminating them. A company that experienced this first-hand is Trelleborg Sealing Solutions in Denmark. It needed a single way to optimize production for orders – from one unit to several million. Customers were demanding lower prices, higher quality and faster delivery, and global competition was gaining on them in market share. The company was faced with constant demand for increased efficiency on all fronts. To accomplish its many goals, Trelleborg sought out Universal Robots. With UR’s flexible, lightweight robot, Trelleborg has a useful tool to optimize everywhere within its production. In just two short years the company went from zero to 42 robots and hired 50 extra employees to manage it all. Only 10 percent of jobs are fully automatable, and with cobots the production rises 50% – without job losses. From 2017-2020, robots will create upwards of 2 million jobs globally, but no machine will ever replace human dexterity, critical thinking, decision-making and creativity. 42 UR cobots at Trelleborg Sealing Solutions increased efficiency and competiveness resulting in the company hiring 50 new employees. It’s true that there are some robots that are large, cumbersome and difficult to operate. One might say they practically require a PhD to run them. But not cobots. 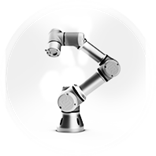 Cobots are easy to implement, operate and maintain. And, because they’re so compact and lightweight, there is no need to change the production layout when switching the cobot between tasks. They’re easily programmed or re-deployed, and require minimal maintenance. At RSS Manufacturing and Phylrich in California, a short-run production company, it only took 45 minutes to set up and program the Universal Robots unit to perform simple tasks. 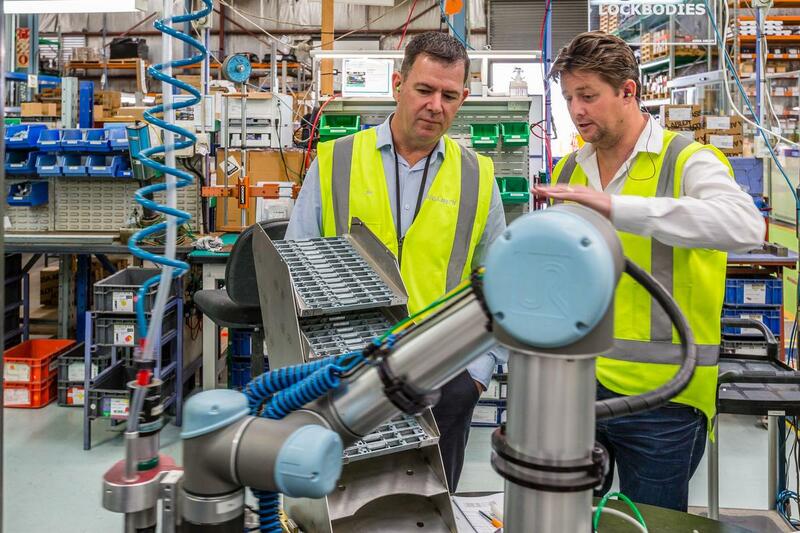 Deploying a UR5 robot for its machine tending increased production speed significantly while opening up 30% more capacity on existing machinery, enabling RSS Manufacturing to compete with overseas manufacturers. 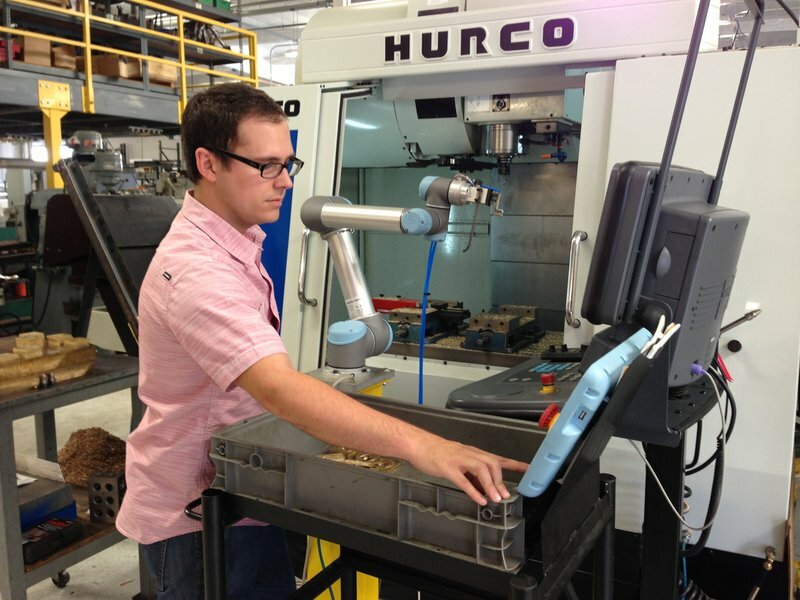 RSS Manufacturing and Phylrich in Southern California uses a UR5 cobot to load and unload parts in a CNC machine. The company had the robot up and running in just 45 minutes. With traditional robots, it’s impossible to work with them side-by-side without some serious safety concerns. Given their built-in safety functions, cobots and individuals can work in tandem without needing cages (subject to assessment). Universal Robots new e-Series cobot line has 17 safety functions certified by TÜV Nord and is in compliance with EN ISO 13849-1 and EN ISO 10218-1 machinery safety standards for unobstructed human-robot collaboration. One company that relies heavily on the ability to work closely with cobots is Norwegian meat producer Nortura. The company needed to optimize palletizing but had no room for safety caging. With a Universal Robot and a ceiling-mounted vision system, Nortura was able to implement a cost-effective palletizing system in one-fifth of the space typically required. Now, it can stack upwards of 20 pallets a day – totally 1700 boxes. 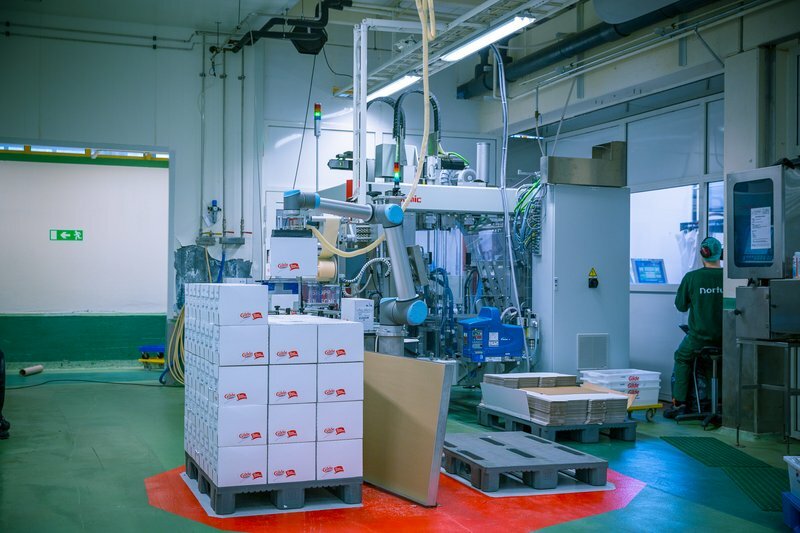 Not all robots need to have space on the ground, so by being creative Nortura was able to increase production without having to rearrange its already tight production line. There is some truth to this myth – robots can be expensive. But that is not true for every kind of robot. For cobots, upfront costs are typically only 20% of traditional robots, with an average payback period as short as six to eight months. Cobots are cost-effective and their installation requires minimal investment, given they do not need major infrastructure changes. And, unlike traditional robots, they can also be redeployed to different functions in the production line and used around-the-clock. For Dynamic Group, an injection molder in Minnesota that manufactures medical devices and other precision products, the challenge was finding people to work on its manufacturing lines. With its headquarters in an area with low wages and high unemployment, it looked to Universal Robots to implement tasks that normally would have been done by a human. 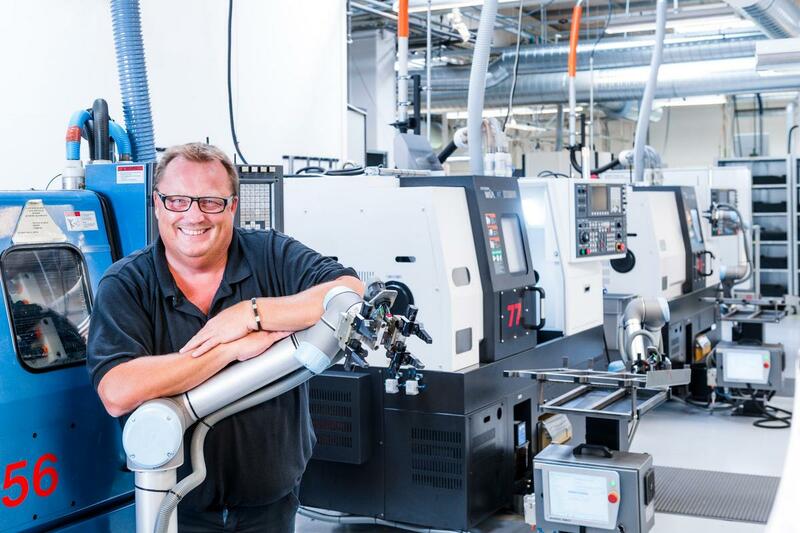 After installing three Universal Robots, Dynamic Group experienced a 400% increase on injection molding production, paying themselves back in only two months. “My initial assumption was that this would cost hundreds of thousands of dollars and extra hires, and I was just wrong,” said Joe McGillvray, CEO. “We were rookies at this. To have such success out of the gate is unprecedented and completely unexpected,” says Joe McGillivray, CEO of Dynamic Group in Minnesota. Cobots made up just five percent of the $14 billion industrial-robot market in 2017, but are estimated to jump to 27 percent of a $33 billion market by 2025. Download our ebook to get started with cobots today!